The Critter Team offers raccoon removal for many different aspects of places, whether it be inside an attic of a home or inside a business. They can manage the problem from the inspection to the clean up. We offer many different trapping options that can fit any situation. The inspection itself is a very thorough process of finding the entry points the raccoons have made to gain access in your home or business. It can be the roof, vents, or other places that many people would not think a raccoon can fit in! From there we will determine what the best tapping would be. 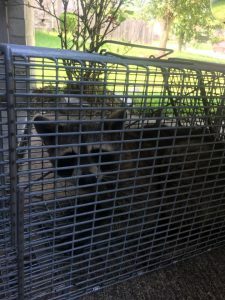 Trap placement is essential to have the best opportunity to catch raccoons. Ground trapping is common if they do not have access in your home, but come and eat food from a pets bowl or a business’s dumpster. Sometimes it is necessary to attach a trap to the outside of the house or business. Many people believe that putting a trap inside an attic can attract a raccoon, but that is not true. It is important to have the trap where the most activity is. Raccoons typically have more than one entry point to ensure they have a way out. The Critter Team’s technician will seal the other entry points so the raccoon will have no other choice than to go into the trap. If there damage with insulation, we can repair that too! We can remove the damaged insulation, sanitize the area and place new insulation in the attic of the home or business. The Critter Team has a one warranty for any exclusions for homes and business’. Our warranty guarantees that our work will keep wildlife out of a home or business or we will come out and repair the damages at no cost to you.